Irish ministers met this morning while British cabinet is due to meet at 2pm. UK PRIME MINISTER Theresa May is due to give a statement this evening on the reception the latest Brexit deal has received from her ministers. May has been briefing her Cabinet about the latest Brexit deal agreed between British and EU negotiators in Brussels since 2pm, according to UK reports. The details of the deal has not yet been made public – in fact DUP leader Arlene Foster says she hasn’t seen it – but it looks as though it will be a compromise in the form of a UK-wide customs arrangement, which would be “a first cousin” of the Customs Union and would avoid a backstop. 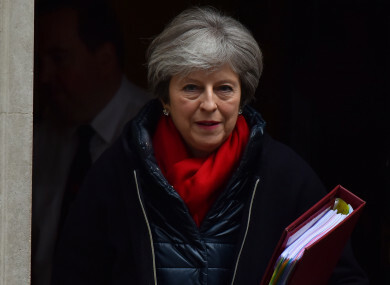 It had been reported previously that May would give a statement to the House of Commons after briefing her ministers; at first it was reported that she would give a statement at 5pm – that was then pushed back to 6pm, according to UK media reports. In the past few minutes a UK government spokesperson said that the statement had been cancelled, only for that statement to be refuted by No 10. It’s been reported that May is still briefing her Cabinet, and will give a statement later this evening. I'm on Channel 5 News from 6:30pm getting irritated about Brexit. Taoiseach Leo Varadkar and UK Prime Minister Theresa May will hold Cabinet meetings today to discuss an agreed draft text of a Brexit withdrawal agreement. It emerged last night that Britain had finally agreed a draft Brexit deal with the EU that would see a temporary UK-wide customs arrangement with specific rules for Northern Ireland. The draft deal has not yet been made public but some UK Brexiteers and DUP politicians have already committed to voting against it in parliament. This deal would avoid a hard border in Northern Ireland with a backstop coming in the form of a temporary UK-wide customs arrangement, with specific rules for Northern Ireland. Last night, the Taoiseach, Tánaiste Simon Coveney and Minister of State for European Affairs Helen McEntee met with officials to assess the state-of-play ahead of this morning’s cabinet meeting to update government colleagues on developments. A government spokesperson has said the situation is “fast-moving”. The meeting began at 9:30am with ministers remaining tight-lipped as they arrived at Government Buildings. Varadkar says it remains the position that backstop should apply ‘unless and until’ another arrangement and the hope is it will never be used. Speaking in the Dáil during Leaders’ Questions this afternoon, Varadkar said the UK and EU may be in a position to have an emergency EU Council meeting this month to approve the draft deal. Varadkar said that text of the deal could be published tonight and that the EU Council meeting could be held on 25 November. Varadkar said the government will be in a position to brief the other party leaders later today. He also stressed that the backstop would only come into force if no negotiated future relationship could be agreed. “I think it’s important to remember what the backstop is. The backstop is not our preferred solution, it is a fallback, it is an insurance policy,” he said. Varadkar also made a point of addressing Unionists who he said may be worried about the outcome of negotiations. “I want to say to them that the Good Friday Agreement will be protected and that includes a recognition that we respect the integrity of the United Kingdom and that we respect the principle of consent,” he said. Meanwhile, British Prime Minister Theresa May will hold an emergency cabinet meeting with ministers and the Attorney General this afternoon at 2pm to discuss the draft text. May must still get the reported deal through her cabinet and then the divided House of Commons. If May’s cabinet agrees to sign off on such an arrangement it would clear a path for EU leaders to also give their approval to the deal later this month. Speaking at PMQs today, May said that a draft deal had been reached and that she would brief the House of Commons again after she has held the Cabinet meeting. “This morning I had meetings with ministerial colleagues and others. The Cabinet will meet this afternoon to discuss the draft agreement that the negotiating teams have reached in Brussels and the Cabinet will decide on the next steps in the national interest,” May said. I’m confident that this takes us significantly closer to delivering what the British people voted for in the referendum. We will take back control of our borders, our laws and our money, leave the common fisheries policy and agricultural policy while protecting jobs, security and the integrity of our United Kingdom. An Mr speaker I will come back to the house to update it on the outcome. Following the news of the reported deal, the Prime Minister faced a backlash from leading Tory Brexiteers. Former foreign secretary Boris Johnson, who quit the government in July over May’s strategy, said yesterday that he would not support the deal. “This is a quite incredible state of affairs,” he told reporters yesterday evening. It’s understood that the Irish government’s position is that British ministers should be given time and space to consider the proposals. A spokesperson for Tánaiste and Minister for Foreign Affairs Simon Coveney cautioned last night that “nothing has been confirmed” and that it remains Ireland’s position that the backstop must apply “unless and until” it is superseded by other border-free agreements. “Nothing is agreed until everything is agreed,” the spokesperson added. The EU’s chief Brexit negotiator Michel Barnier is also due to brief ambassadors from the 27 member states this morning. All of the great and the good who were rolled out during the #EURef will be rolled out again in the coming weeks to try and get us to fall into line. We are clear - we will not be voting for this humiliation! This morning, leading DUP politicians have been reacting to the leaked reports of the deal, saying they will vote against it. DUP MP Sammy Wilson described it as “a humiliation”. “What we would find in the future is that Northern Ireland would have rules about agriculture, production, labour hours etc., all dictated by Europe. We wouldn’t have sight of them and if they’ve going to be detrimental to our economy we’d just have to swallow it,” Wilson told Sky News. Despite DUP politicians seemingly to rejecting the deal as a bad deal for Northern Ireland, Scottish First Minister Nicola Sturgeon has said that she would push for the deal to be extended for Scotland. Email “After some confusion, Theresa May WILL give a statement on Brexit tonight”. Feedback on “After some confusion, Theresa May WILL give a statement on Brexit tonight”.